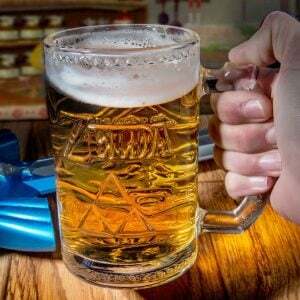 Enjoy refreshment during your latest fantasy quest with this glass tankard inspired by the epic Legend of Zelda series. Featuring Links iconic Hylian Shield, this is an oversized drinking glass is a perfect piece of fan memorabilia. No longer do you need to wear the Deku Mask for that Deku Scrub look! Pay tribute to the most famous transformation from Majora’s Mask with this pair of sawo wood Deku Link plugs! Become the coolest Hylian in your village! Whether you choose health, magic, or life – you’ll smell fresh and fabulous as you go on to save Hyrule! 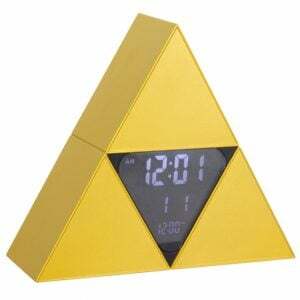 This fragrance set from the Legend of Zelda is perfectly sized to carry with you on all your adventures. Get ready to defeat Gannon, or just keep your games safe with this Master Sword cartridge case! This 3D printed storage device is 18 inches in length and comes with a removable sheath to reveal 6 Nintendo Switch game slots in the sword. Decorate and protect your Nintendo Switch dock with a one of these custom LED dock shields! Choose from two different Nintendo designs and 17 different color settings to transform your dock into a cool glowing display. Make your love travel through time on your special day with this unique sign in guest book! Wedding guests sign in with their fingerprint which makes up the foliage on the Great Deku Tree. A unique piece of art that can be displayed in your home. Who needs an ocarina when you could play your favorite Zelda tune at your finger tips! Customize these stylish rings with your preferred song of choice and display the music notes of your most memorable song from the Legend of Zelda. Wanting to freeze Lizalfos so they stay in place, set Moblins on fire, or looking to electrocute an entire Bokoblin camp? These elemental arrow replicas are the ideal tool to get the job done! They even contain bright LEDs and light up.